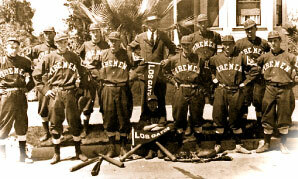 Learn more about Local 1165’s history and our role in the communities we serve today. 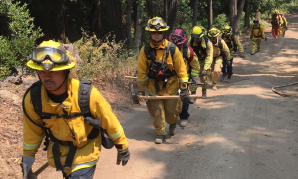 The Santa Clara County Fire Department has evolved from what started out as a District run mostly by farmers, ranchers, and their sons to an organization with more than 250 employees. Much of this growth occurred through fire consolidations. 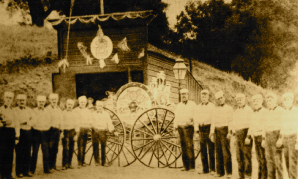 In 1947, The Cottage Grove Fire District and the Oakmead Farms Fire District were consolidated to form what was then referred to as the Santa Clara County Fire Protection District. 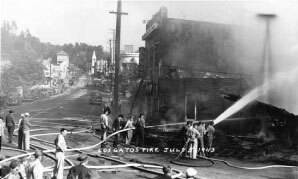 Later in 1970, the Town of Los Gatos, the Burbank Fire District, and the Alma Fire District were added to the list of consolidating agencies. For the next 20 years, consolidations continued. In 1993, 1995, and 1996 the towns of Campbell, Morgan Hill*, and Los Altos/Los Altos Hills consolidated with Santa Clara County Fire Department respectively. Today, Santa Clara County Firefighters Local 1165 proudly serves the communities of Campbell, Cupertino, Los Altos, Los Altos Hills, Los Gatos, Monte Sereno, Redwood City Estates, Saratoga, and various unincorporated areas throughout Santa Clara County. The earliest demands made by the Union were a reduction in the hourly workweek from 84 hours to 67.5 hours, a $50 per month pay increase, three weeks of vacation per year, holiday pay, and a cumulative sick leave policy. In 1955, the work schedule was reduced from an 84-hour workweek to a 72-hour week. Shortly after the original demands, Chief Engineer Henry Linqua suspended Union President Bill Deal without pay. Chief Engineer Linqua stated there was a rule that no effort to organize any activity would be undertaken without permission of the Chief Engineer. Union attorney Thorne argued that this rule was unconstitutional when applied to the formation of a union under state and federal labor laws. In addition to Deal’s suspension, Drill Master Orrin McAbee was demoted to firefighter for unexplained reasons. Both the suspension and the demotion were hotly debated among the Union, the Board of Fire Commissioners and the Santa Clara County Supervisors. Deal and McAbee were never reinstated to their original positions, but their courage laid the foundation for the future of the Local. For the next two years, Union Presidents Harry McGinnis and Willis (Willy) Hall continued to struggle for better working conditions and wages. Under adverse circumstances, Harry McGinnis was forced to resign, and Willy Hall was demoted. Although there was no significant progress in wages or benefits made throughout the 1950s, this era marked the first sixteen promotions for the Captain rank. These promotions also ushered in the advent of a minimum of two people per rig staffing structure. Throughout the 1950s and 60s, acreage was continually being annexed into the Fire District. By 1961, two battalions were formed as a result of increased growth and responsibility within the Santa Clara County. 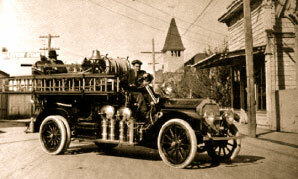 The era of the “Educated Firefighter” began with the development and industrialization of the valley. It became necessary for firefighters to expand their knowledge through job-specific training, a college education, and an academic degree. As the working relationship between the Union and Administration improved, safety issues were addressed, and wages and benefits increased. In 1969, a third platoon was added, and the work week was reduced to a 56-hour schedule. Fire protection improved with more efficient utilization of resources and a reduction in duplicate services. It was also during this era that the first visible changes in safety equipment occurred for the department. Improvements in this area continue today. Throughout the years, many individuals have “stepped up” in the role of Union President for our membership. They are as follows: Mike Harrigan, Jack Salois, Hal Chase, Hal Hendrix, Dennis DeMellopine, Art Marshall, Mark Shumate, and our current President, Adam Cosner. They have attributed and achieved significant gains in safety, benefits, and wages for the people who work in one of the most dangerous professions in the world. Their efforts and sacrifices, as well as those of their respective Executive Boards, should be applauded. Today, the Santa Clara County Fire Department’s Administration and the Local work together in a collaborative and respectful manner. They both work hard to provide the best working conditions, benefits, and wages for their employees while adhering to strict budgetary controls in order to continue to provide the best service to their customers. The relationship between Santa Clara County Fire Department’s Administration and IAFF Local 1165 has fostered an enviable reputation that other organizations strive to emulate. We are ranked as one of the top Departments in the nation for services provided to our customers, safe working conditions, and wages/benefits packages for our employees. In addition to the dedication to our members, Local 1165 dedicates a tremendous amount of time and effort to our community. 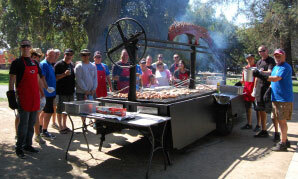 We donate time and funding to various organizations through barbeques and other events. The Los Altos Hills Family Day BBQ, Cupertino Community Services BBQ, Billy Jones Railroad Society BBQ, Santa Clara County Foster Parents Association BBQ, San Jose Historical Society BBQ, and Trolley Car Society BBQ are a just a few of the annual events we host. In addition to providing barbeques throughout our community, we also help raise money for the Muscular Dystrophy Association and the Alisa Ann Ruch Burn Foundation through annual fundraising events. Local 1165 is an active participant in the political process and maintains an awareness of all issues facing firefighter safety, working conditions, and any other firefighter-related concerns. In affiliation with the IAFF and CPF, Local 1165 Executive Board members make annual trips to Washington D.C. and Sacramento to lobby our congressional and legislative representatives. Along with our fellow IAFF and CPF brothers and sisters, we continue to fight for issues affecting the lives of firefighters and their families. Our first Union President, Bill Deal, said it best: “We are a non-striking Union interested only in the betterment of working conditions and the security of our jobs and our department.” Almost 60 years later, those words still ring true. As a Local, we will continue to carry the torch and to follow the path laid out before us by past members. The love and passion we feel for the job and for each other will serve as our motivation for whatever lies ahead.